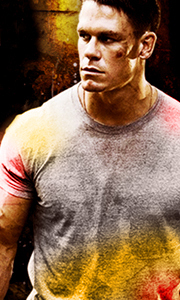 THE MARINE: WWE CHAMPION JOHN CENA stars as marine John Triton. Wherever there's danger, Triton is usually in the middle of it... and he doesn't play by the rules! After he's unwillingly discharged from Iraq, Triton's beautiful wife Kate (Nip / Tuck's Kelly Carlson) is kidnapped by merciless jewel thieves led by a vicious killer (Robert Patrick). Now, Triton must fight to save her, utilizing his most powerful weapon - himself! THE MARI..
Own The Marine / The Marine 2 DVD from Deff, DVD, Blu-Ray & 4K Video Specialists - Free UK Delivery..
WWE Superstar Ted DiBiase joins "the few and the proud" in this explosive tale of white-knuckle action, stunning effects and true heroism fit for the Marines. This fully loaded DVD brings the action home with six featurettes, Muay Thai fight outtakes and much more! On a well-deserved vacation to an exotic resort, Marine sergeant Joe Linwood (DiBiase) and his wife Robin are attending a VIP party when disaster strikes. Ruthless terrorists..
WWE superstar Mike "The Miz" Mizanin delivers a knock-out performance in the most explosive, action-packed Marine adventure yet. After returning to his hometown on leave, Sgt. Jake Carter learns that his sister has been abducted by a band of violent extremists. To save her, Carter launches a daring one-man assault on their base of operations...only to discover the group's ruthless leader is plotting a deadly terrorist strike. With time ..
Own The Marine 4 - Moving Target DVD from Deff, DVD, Blu-Ray & 4K Video Specialists - Free UK Delivery..
WWE CHAMPION JOHN CENA stars as marine John Triton. Wherever there's danger, Triton is usually in the middle of it... and he doesn't play by the rules! After he's unwillingly discharged from Iraq, Triton's beautiful wife Kate (Nip / Tuck's Kelly Carlson) is kidnapped by merciless jewel thieves led by a vicious killer (Robert Patrick). Now, Triton must fight to save her, utilizing his most powerful weapon - himself! Special Features The..
After returning stateside and now working as an EMT, Jake Carter (Mike "The Miz" Mizanin) finds himself trapped with an injured, marked man he's sworn to save. As a ruthless biker gang bent on revenge gains speed, Carter must use his killer Marine instincts to end the rampage... or die trying! Special Features Evening The Odds, Superstar Studded..